The 3-week intensive curriculum provides an opportunity for students to experience an immersive language environment to gain skills that may be applied to real situations. Students will have ample opportunity to practice as they learn Urdu from experienced Penn faculty through thematic conversations and activities while participating in many authentic cultural settings. 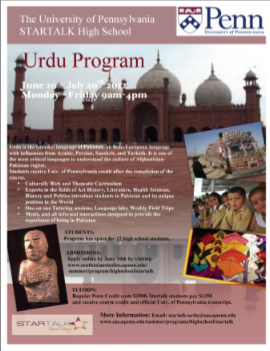 Experts in the fields of Art History, Health Sciences, History, Politics, and Literature will expose students to Pakistan’s rich history and culture, and the country’s unique place in the world today. Small class sizes (8:1) ensure that students are given individualized attention. Students will leave the program with greater faculty and understanding of the Urdu language and Pakistan at the college level. The program will provide daily authentically relevant lunch and snacks to students. Students will be provided with books and additional learning materials for the program. At the end of the course, students will receive a learning packet of Urdu materials to aid further self-study, including access to a Blackboard Urdu Startalk website managed by the Univ. of Penn.’s South Asia Center. Students will also receive a credit and an official Univ. of Penn. transcript upon successful completion of the program.